The real estate market in Johor Bahru continues to favor renters (at the expense of owners). This results in many good deals for those looking to rent. The Setia Sky Executive Suites @ Bukit Indah is located in Bukit Indah. Two 25-story towers hold 364 units with built-up areas ranging from 751 – 2,778 square feet. In my opinion the pool is the best part of the project. The units are ok but the pool is amazing. The location is pretty good too – there are quite a few shops surrounding the area (and with a Giant and Tesco right across the street). Rents range from 2,000 MYR/month to 3,000 MYR/month (for 820 to 1,500 square feet) which is less than a few years ago. Purchase prices range from 600,000 to 800,000 MYR (for 1,100 to 1,500 square feet units). MYR 3,000/month – 3 + 1 bedrooms, 3 bathroom, 1,500 square feet, fully furnished. 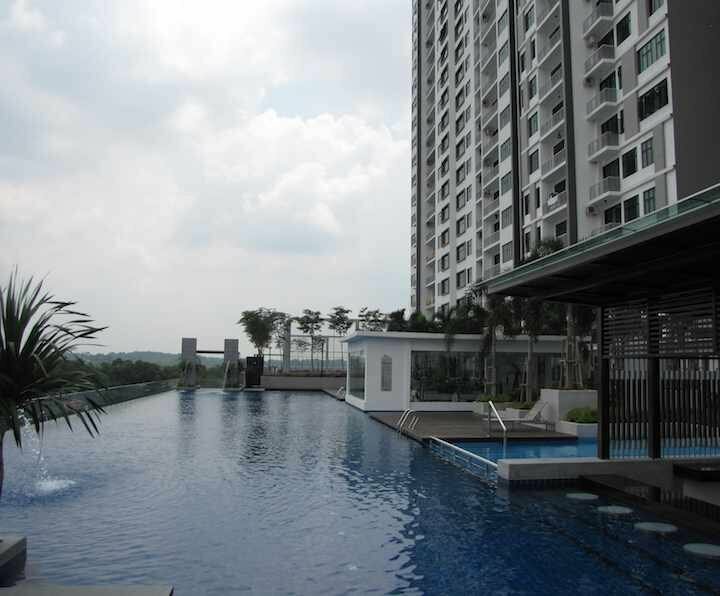 MYR 1,900/month – 1 + 1 bedrooms, 1 bathroom, 751 square feet, fully furnished. MYR 2,500/month – 2 + 1 bedrooms, 2 bathroom, 1,168 square feet, fully furnished. There are many units available in this condo. See more details on our Setia Sky Executive Suites information page.